Delivery from £10.00 to United Kingdom in 8 - 15 working days. A young lady washes at the side of a babbling brook, dressed in luxurious velvets and taffeta, we can see this is no servant girl. Cherubs and landscape are glimpsed in the background. 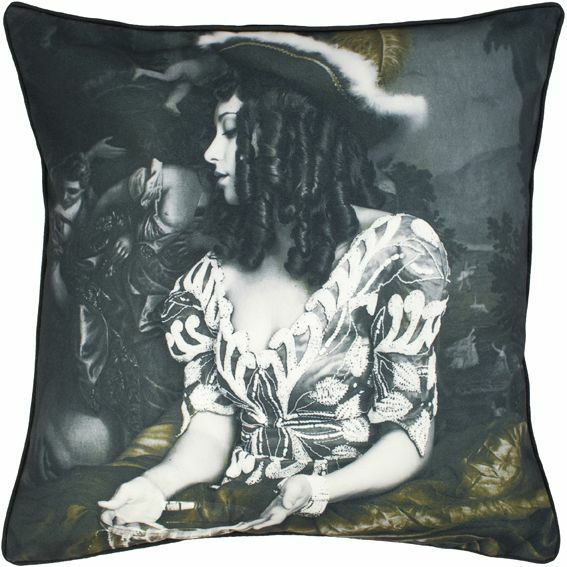 This cushion will offer a modern twist derived from the traditional pastoral portraits of the 18th century when landed gentry were depicted outside in their pleasure gardens and grottos. "We wanted to create a design wonderland, where everyday objects are more than just functional, they contain stories, love, art and poetry..."